Last summer I was given two shopping bags full of beautiful, ripe mangoes from a friend’s tree. Lucky us! We ate mangoes for days. It isn’t an Aussie summer without at least a daily session with a ripe, sweet, slightly tangy, juicy mango. You end up with an orange smear around your mouth, fibre stuck in your teeth, sticky hands (and forearms if it’s a super juicy one) and a big smile on your face. We had so many mangoes I decided to try making a chutney. Seeing they were so ripe and soft, it really turned out like a jam. It is sweet, a little sour, fragrant and spicy! It is not like traditional mango chutney made with under-ripe mangoes, with firm chunks and a sticky consistency. But it is fantastic with curries, grilled meats or even a firm cheddar and crackers! Note! You will need to have pre-prepared some jars for storage. I used good quality, recycled canning jars with pop-seal lids. 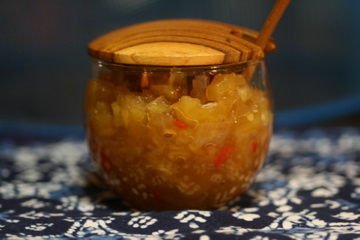 If you need help with the process of preparing jars for preserves, click here. Heat the oil in a sauce pan over medium heat. Fry the onion, garlic and ginger until golden brown. Add the mustard seeds and stir until they start to pop. Add remaining spices and cook for 3-4 minutes, stirring. Add the sugar and vinegar and stir until the sugar has dissolved. Add the mango and stir. Reduce heat to a low simmer and cook uncovered for about 20 minutes or until a thick consistency is reached. Take off the heat and carefully spoon the mixture into your sterilised jars and screw the lids on while still hot. Allow to cool on the bench and then store in a cool, dark place for at least a week before eating. I made about 3 medium sized jars from this recipe. I opened the last jar last night, and it is August now. It had developed so nicely and was better than the first and second jars we ate. Be sure to store in the refrigerator after opening. This is so good with curry. Try my easy Biryani recipe. two4six8 grew up on it. On hot buttered toast. With cheddar and cucumber on toast (my sister in law’s brilliant invention), a spoonful in my bolognese. And my all time favourite… Honey and Vegemite on toast. Strange, but yum. Last Sunday night after a boozy afternoon, I was at a Chinese restaurant in Brisbane’s China Town, greedily ploughing into a hot plate of Shantung chicken. Although I’ve eaten it a lot I’ve never known how it’s done. And I can never decide if I like the hot, crispy skinned chicken and sweet, sour sauce or the fried spinach garnish better. This blog does a fine job of explaining the dish. Now I know what to do with the bottle of black vinegar I bought randomly over a year ago. And now I know what that sweet, sour, slightly ferment-ish DELICIOUS flavour is that my mate Andy was puzzling over after eating it at the restaurant. He thought it tasted like Vegemite. Maybe. Can’t remember if he said it, or if I thought it, but I’ve been thinking about Vegemite chicken since Sunday. To my mind there had never been such a thing, but I was wrong. Of course it exists. 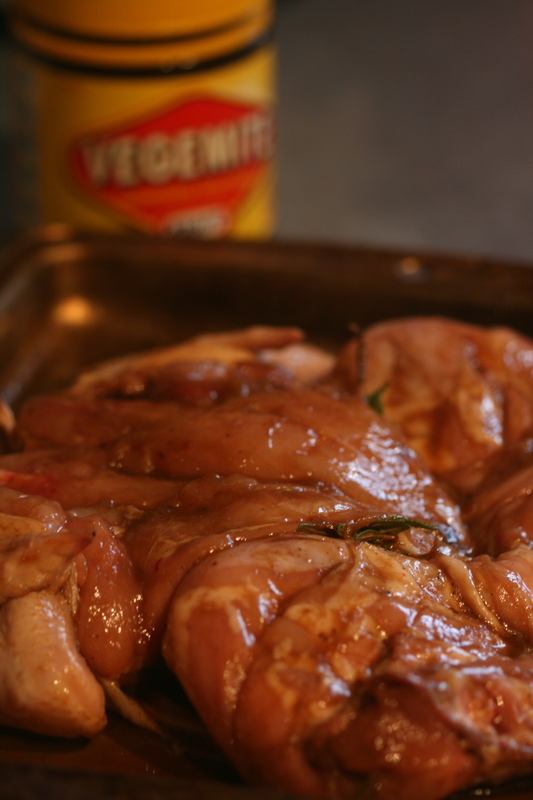 There’s apparently a recipe for Vegemite chicken wings right on the back of the jar! There is nothing new under the sun, as the phrase goes (and so, often, does Andy). A simple google search has consistently annihilated any original culinary idea I’ve ever had, pretty much. Tempting as it was to bastardise the Shantung chicken recipe with the addition/substitution of Vegemite and claim it as my own, although reflecting the true colonial spirit of Australia Day (oops that was political, wasn’t it?) 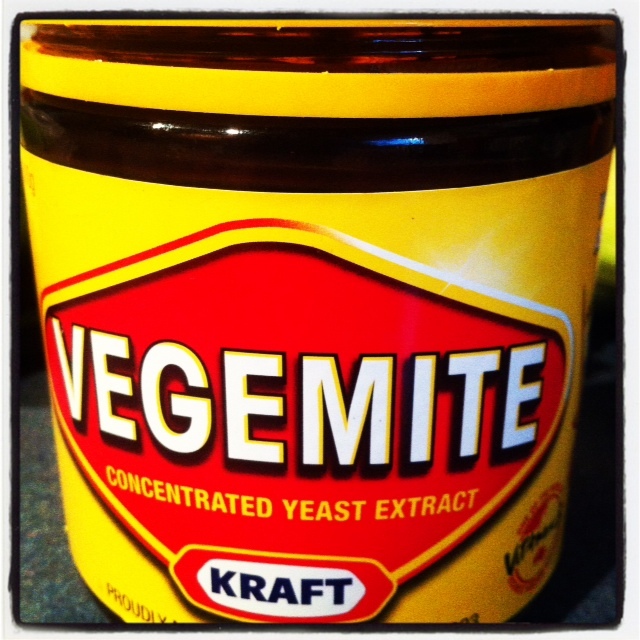 I decided to stick with my Aussie instincts in the use of this most cherished and familiar ingredient. Here’s what I came up with… It was beautiful – sweet, salty, a little malty. I’m not convinced I’d choose it over Shantung chicken but hey, it was fun to invent something new! Well, new for me anyway. Simply mix all the marinade ingredients in a jug/bowl and stir well to combine, ensuring the sugar and Vegemite have melted/dissolved thoroughly. Hide the rosemary under the bird or under the skin of the bird and then smother with marinade, rub with your hands to ensure even coverage. Cover with glad and refrigerate. As usual, at least an hour is ok or overnight if possible. Preheat oven to 200 degrees celsius. Melt around 50 grams of butter. Baste the chicken lightly with butter. 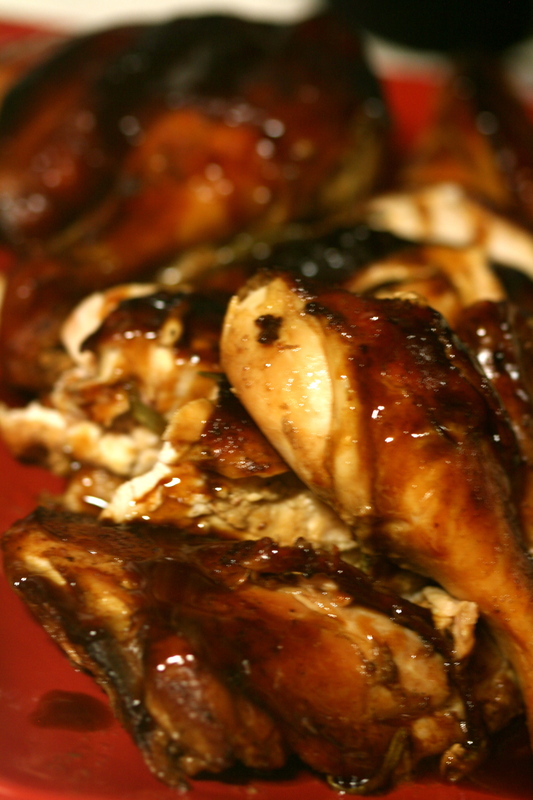 Cook for 20 minutes then reduce heat to 180 for about 40 minutes-1 hour depending on the size of your bird. Cover loosely with foil if the skin is burning. Drain the juices from the pan. If you want to, strain off the chicken fat. Let the cooked chicken rest, covered with foil, for at least 10 minutes. 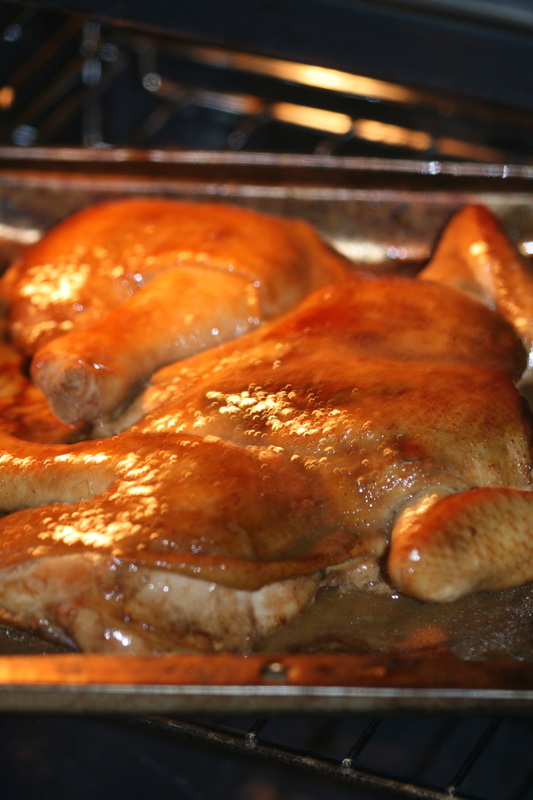 Cut the chicken into pieces and serve with the pan juices. A milder alternative to my fiery Sambal. Place all ingredients in a saucepan and simmer, uncovered, until most liquid has evaporated and the relish is syrupy and soft. Store in a glass jar. Best eaten after a couple of weeks resting in the fridge. Yummy with fresh mint or coriander stirred through. Fresh cayenne peppers, underrated and unfairly upstaged by the dried powdered form. 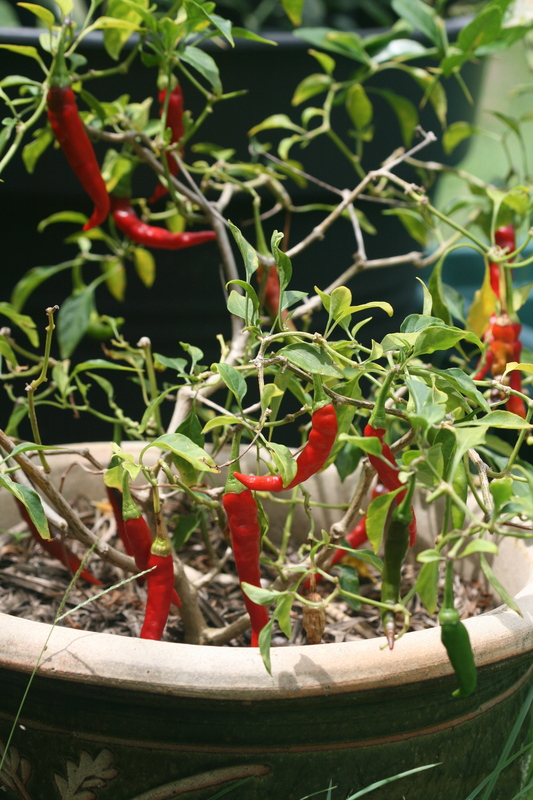 These chillies grow really well in pots. This plant has fruited abundantly at least 5 times now. They're hot, but not mega hot and de-seeded have a great flavour.